In Case Interview Secrets, you'll discover step-by-step instructions on how to dominate what many consider to be the most complex, most difficult, and most intimidating corporate job interview in the world -- the infamous case interview. 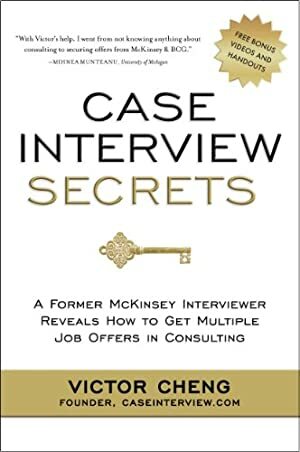 Victor Cheng, a former McKinsey management consultant, reveals his proven, insider's method for acing the case interview. Having personally secured job offers from McKinsey, Bain & Company, Monitor, L.E.K, Oliver Wyman, and A.T. Kearney, he has also been a McKinsey case interviewer -- providing you with a hands-on, real-world perspective on what it really takes to land job offers. We started tracking this book on May 24, 2012. This book was $20.62 when we started tracking it. The price of this book has changed 550 times in the past 2,526 days. The current price of this book is $18.80 last checked 23 hours ago. This lowest price this book has been offered at in the past year is $12.96. The lowest price to date was $12.96 last reached on March 5, 2019. This book has been $12.96 one time since we started tracking it. The highest price to date was $32.84 last reached on August 12, 2016. This book has been $32.84 one time since we started tracking it. We last verified the price of this book about 23 hours ago. At that time, the price was $18.80. This price is subject to change. The price displayed on the Amazon.com website at the time of purchase is the price you will pay for this book. Please confirm the price before making any purchases.